Swarovski crystals in turquoise AB and chrysolite AB and handmade lampwork glass beads in white, purple, lime green and turquoise blue hang from delicate sterling silver chain. Earwire is made by hand using 20 gauge sterling silver wire. 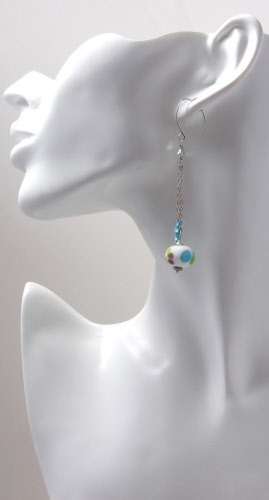 Earrings measure 3⅜ inches from top of earwire to bottom of dangle and weigh 0.15 oz each.